We do not acept reviews from the country whre the accommodation is situated. I will start with the board. 4* it is not more like a 2*. They claim it was all inclusive.. Rubbish!! the drinks included are Ouzo, local beer,Brandy cheap soft drinks from a pump (All tasted as if they had been watered down) No such drinks as Vodka, Whiskey, Martini etc.. The food at this hotel is a disgrace. A lot of the food was recycled eg. The fatty beacon for breakfast was used in a hot pasta dish for lunch then a cold salad for dinner. There were very little to chose from at each meal time and was repetitive. Our room had a double bed and two single beds. They were cleaned daily except on a Sunday. Towels were not changed regulary. Bedding changed once in the week. The bathroom was a complete disgrace. the shower had a shower curtain that did not fit, therefore all the water went on the floor. The plumbing did not work properly so the bathrorm smelled awlful sometimes.There was old wiring hanging from the bathroom wall. My friends room was exactly the same so this was not exclusive to my room. The staff could be rude and abrupt at times (especially the poolside bar staff) On one occassion a member of staff was arguing with another member of staff (In english)in the restaurant area using obsenities in front of all present including my children., Shocking!! Sissi Is a lovely resort with a lot of bars and places to eat. The locals were very friendly and the local beach was small but beautiful. We ate at a plcae near the harbour called Ploris it was great!! All in all Sissi is lovely with lovely people. Sissi Bay Hotel is alwful. The staff are rude the rooms are sub-standard and there was not free entertainment. I love all inclusive holidays this truely should not claim to be all inclusive as it is not. I spent so much money eating and drinking out as I could not risk eating the hotels food and I wanted a drink that was not watered down. Please do not waste your money. I feel I have been ripped off by my tour company. On arrival we were met by friendly reception staff who worked together with holiday rep and were multi-lingual. We were taken to a clean, airy room with a double bed and two singles - all very comfortable. The bathroom was small but clean with complimentary soap and towels are provided. You can have air conditioning for 39 euros for the week and a safe for 16 euros which is located in room. One pool is by reception/main bar which is located inside and not open as the weather is too nice to sit inside, the other two pools are by the restaurant/bar with sun loungers set out on grass to the right. The bar staff are very helpful, especially Sabine who is multi-lingual in German, English and Greek. She suggested that we upgrade from Half Board to Inclusive (15 euros for an adult and 7.50 euros for children per day) and we found it worth while. Breakfast from 7.00 till 10.00. Snacks can be ordered from 10.30 - 12.00 at the bar. Lunch from 12.30 - 2.30. Dinner from 6.30-9.30. The food is basic but delicious, our children ate everything and I am vegetarian. The staff were brilliant especially Dimetri and Kara. No night entertainment provided apart from special nights which are advertised and you make a small payment, which goes towards the performers costs (fair enough) but sitting by the pool having a drink and playing cards is the perfect way to end the day and our children did not get bored. The location is breathtaking and quiet (think small village in England and you will not be far off how quiet the resort is) but busy night life is only a taxi ride away (15 euros each way) and then you can escape back to the quiet!! Sissi bay hotel has a great location, and our room faced the sea front. But no air conditioning as a result of that. The food was to say, basic, and in all honesty, of a poor standard. Although the room was mopped daily, and the bed and towels changed every other day, that was all. The wardrobe smelled musty, and found several roaches. We found the service at the pool bar (main bar was never open) to be abrupt. There are 2 pools, one of which is lovely, the other is located right outside the restaurant. Entertainment consisted of bingo, every night. Facilities were very basic, and would not consider it to be 4 star, apart from location. We arrived on 21st June and the manageress and reception attendant couldn't decide which information to give us about our room. We were told that it was 49 euros to hire the air conditioning for the week and 16 euros to hire the room safe. We were told there was entertainment that evening in the form of a barbecue and it was 10 euros each. Even though my partner is a vegetarian we decided to pay as there was traditional Greek dancing. We were then escorted to our room which was in the old wing of the hotel. The room was very basic and was definately not four stars as was advertised. 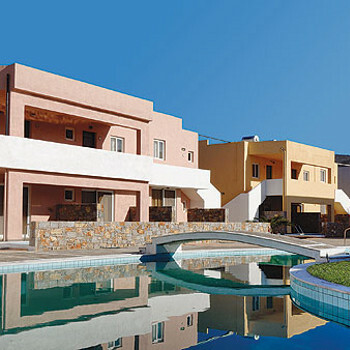 Four stars in Crete applies to the amenities and not the service and accommodation provided and is set by the hotel itself. We only received one change of bed linen in 7 days and 2 changes of towels. This was only after I had complained. The food was very basic and recycled from meal to meal, i.e the meat from lunch was reshashed and resauced for evening meal. The resort was geared more for the Germans and Dutch than anyone else and the majority of people we spoke to ate out after 2 nights. The grounds of the hotel and pool area were well cared for and the flowers and trees were beautifully kept. Pity they couldn't have the same standards in the rooms. To be fair to the hotel, they are working on a limited budget provided by the tour operators therefore make little or no profit. This hotel has an official tourest board rating of 4 star however it was sold to us as 3+. staff.Then we were taken to our room to find a large bright bedroom with 2 single and 1 double bed a small but functional bath room and a terific sea view. Our room was cleand daily towels changed every other day and bed linin in mid week. The hotel also has a childrens play area, a garden with parasols and loungers,a free form pool with bar and a small dining room. All areas were well kept and clean. The food on offer to A.I. guest started with a continental buffet breakfast ( cold meat,cheese,fresh bread,cerials etc. ).Lunch offerd 2 local and one international dish,a hot vegetable dish and a fine selection of fresh salads.Dinner for me was the best as a lover of mediteranian foods, I found four hot main dishes,and vegetable dishes again salads were avilable. The bar served one local beer together with local spirit and wine I particulary enjoyed the red wine which was supplied from one of Crete's finest vineries. The staff did very well bearing in mind the multi national selection of guest many of whom do not speek greek,we found them smart in appearance and attentive to thier guest's. Entertainment was a little lacking as Sissi is only a small village. But the National Night is proberbly the best I have been to over the years.A local 3 peice band entertaind us with a troup of dancers who performed not only traditional Cretain but also dances from other parts of Greece.The food prepaird by an award winning head cheff and his staff was a symphony for the eyes and taste buds with a mezzi of meat and vegetable dishes followed by the usual very sweet selection of greek pastries. If you don't like Greek food the hotel also offers some 3 star self catering appartments. Worth another visit a plesent place to just hang arround and chill out..
we were led to believe all rooms had air conditioning we got none the rooms that did have it holiday makers had to pay an extra 44euro's a week to have it switched on when you arrived.There was no entertainment at all for Kids and Adults as for All Inclusive this was a diabolical statement the choice was 1draught Beer (German)Ouzo'Raki'Brandy but not Metaxa a very cheap substitute All inclusive guest's ceased to be all inclusive after 11pm and had to pay for all drinks taken after that time.Kids got 1hour during the day to have a free ice cream the only pop they got was a cheap pop on pump. My husband and I booked the Sissi Bay Hotal as a last minute teletext holiday and did not know what to expect.We were pleasantly surprised. The food was fine, with a good selection at all times although the bar meals looked better.Particularly enjoyable were the salads and fresh olives.Lovely cake was served at 4pm along with coffee and tea. There was not a huge selection of drinks on the al inclusive menu if you liked to taste many different drinks.Soft drinks were fine as was the beer. The location of the hotel was a bit out of the way and it was 2km to the bus stop from the hotel. However, Sissi is very picturesque and there are many nice restuarants, pubs and taverns to frequent.Taxis are readily accessable if one wanted to go outwith sissi, but the could add a lot of expense on to the holiday. Air conditioning was to be purchased at the hotel and this was more expensive than we anticipated at about 45 Euros for the week, however it was essential. Another problem was that the hotel did not take visa which meant that we had to use about 60 euros of our spending money before we even got to our room. The staff all spoke good english, german and greek and were friendly and helpful at all times. Entertainment, however, was poor and this would have been a problem if we had booked for two weeks. Only twice per week. The room that we had was ground floor and looked directly onto the pool area. This was fine if other guests had not used our terrace wall as a seat and the staff did not put a large ashtray on our wall.We moved the ashtray on several occasions but it was always moved back. Our privacy felt invaded. The good points about this hotel definately outweighed the bad and we would definately go back.